Less than two weeks into 2012 and I have already conquered a challenging task! I assembled this tiny Triceratops. It was so fun! Find brightly-colored table, so pleasing photos can be taken of assembly process. Spread out materials so project looks important and organized. Stare at directions for 5 hours. Gently wedge teeny pieces together. Secure with a dab of glue. Massage tiny Triceratops so his feet all touch the ground and his ribs are evenly spaced. Find a place for tiny Triceratops to live. 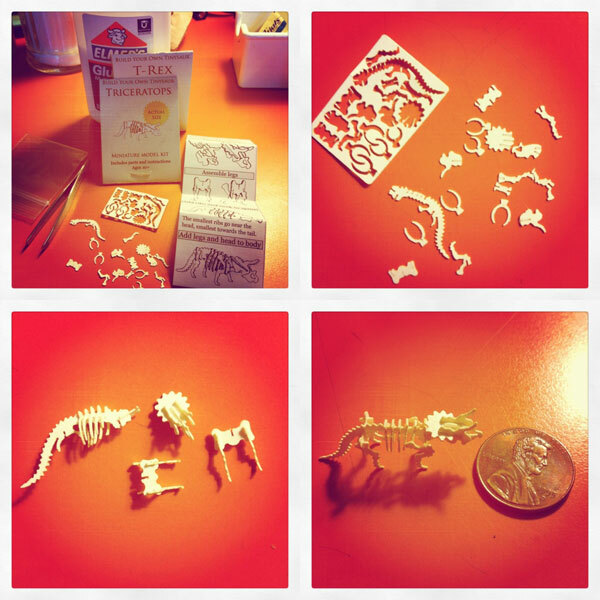 If there were one of these tiny models for every animal on earth (or uh, in Heaven) I would definitely collect them all and start a tiny menagerie. Sadly, all I have is this guy and a as-yet-to-be-assembled T-Rex. I plan to do the T-Rex soon, but have to find another brightly-colored table or the pictures won’t come out well.